RockUnitedReviews: CHAOS MAGIC: "Chaos Magic"
"Sometimes all is lost. Wishing to sleep forever". Chaos and magic. Words that goes hand in hand with the bonker mad genius that is Timo Tolkki. The creator of Stratovarius and other side projects such as Avalon, Revolution Renaissance, etc. are returning to the scene of the crime with his latest project. Tolkki is as always the creator, songwriter, producer, and musician behind it all. 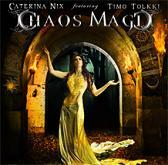 Chaos Magic speaks however volume of symphonic female fronted metal and the Chilean singer Caterina Nix. Appearing on Tolkki's Avalon's project, the soprano/classical trained vocalist take the spotlight with ease and delivers one half impressive note after the other. The booklet photos are rather one dimensional though and could have you thinking about the desperate housewife at the mansion. Very dated style-wise and doesn't exactly give the impression of the strong and independent woman. Anyhow, let's move on. I believe this to be yet another decent Tolkki project since the days/daze of Stratovarius. Not because it's the unique experience or anything. It's got more to do with attitude and fighting against all those haters out there. It's one more chance to prove them all wrong. Sadly it's not quite up there with his best work and the music is so 2005 somehow? Female fronted epic symphonic power metal has been done to death. This is just one more in a long run of half decent albums in/of the genre.